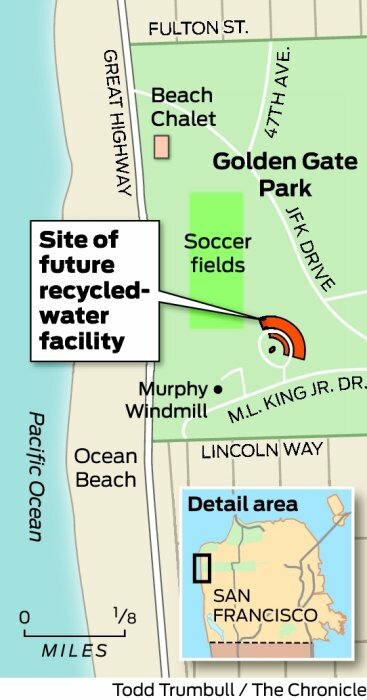 Today, San Francisco's water utility will unveil a proposal for the city's first large-scale water recycling project, an arc-shaped facility near Ocean Beach that would filter and disinfect 2 million gallons of sewer and storm water each day for use on 1,000 acres of San Francisco land. 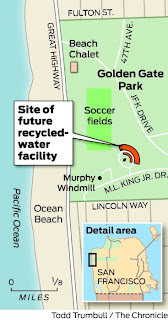 The $152 million Westside Recycled Water Project would be used to water Golden Gate Park, the Presidio Golf Course and Lincoln Park. As proposed, the Westside project would take treated wastewater from the Oceanside Water Pollution Control Plant near San Francisco Zoo, run it through fine membranes and ultraviolet-light systems, and spread it through the network of existing pipes and sprinklers snaking through the parks. The water could also serve to flush toilets at the California Academy of Sciences. All told, San Francisco will attempt to save some 10 million gallons a day through both recycling and conservation. Peninsula and East Bay cities, represented by the Bay Area Water Supply and Conservation Agency, are attempting to save about 20 million gallons a day.